Since 1960, Nigeria politics have been influenced by the following groups called “Mafias”, “godfathers” and “Cabals”. The Nigerian political era is not complete without mentioning the influence of these groups on the life of a typical Nigerian. The “Mafias”, during their era in Nigeria, ensured that the most prominent political positions in the country, whether in the military and civilian regimes, were dominated by them. This enabled them to control the rest of the country. Unfortunately, the dominations of the Mafias were put in control by Chief Olusegun Obasanjo regime when he resumed office in 1999. During the era of godfatherism, political parties take orders from Godfathers. The godfathers impose candidates of their choice during elections. The Cabals are related to the Mafias in the sense that they consist of a shadowy group of people bound together by some sinister political interests. While the Nigerian Mafia is most likely to pursue sectional interests which could be ethnic or religious, the Nigerian Cabals draw their membership more broadly and combine political and economic interests. But unlike godfathers that are boastful of their illegal activities, Cabals and Mafias operate in the dark and hardly make any statements that could betray their identity but their subversive actions speak louder than voice. The present Cabals controlling the affairs of Nigeria are mainly Fulanis, headed by Abba Kiyari. During President Muhammadu Buhari’s medical vacation, Aisha had lamented that the government has been hijacked by a cabal. The wife of the President, Aisha Buhari, was forced to fire the first shot, raising the attention of Nigerians to the activities of people whom she described as “Jackals and Hyenas” that have hijacked the system. Nigeria has been degenerating under these present Cabals, holding Nigeria by the jugular because of lies and deceits used to manage her affairs. No country can run on lies, no matter how foolish the populace might be. Various lies and deceits have been used by this present Cabals to achieve their selfish interests. The current issue of imposing a foreigner, a fraud and unelected pretender to preside over the fate of over 180 million Nigerians is the greatest tragedy to befall Africa. This historic fraud was not perpetrated by Europeans but blacks themselves. The Cabals used it to cheat, pillage and loot the treasury dry. Mazi Nnamdi Kanu last broadcast revealed that liars, cheats, and deceivers are running the affairs of Nigeria. He lamented that “The Yoruba dominated Nigeria media will never do a simple investigative journalism to find out the truth instead they allow their irrational hatred for Biafra, IPOB and Nnamdi Kanu cloud their sense of judgment”. It was established by Mazi Nnamdi Kanu beyond every reasonable doubt that the Nigerian President, Mohammadu Buhari aka Jubril was nowhere to be found at the just concluded World War1 Commemoration Summit in Paris, the French capital city because he is fake, an imposter, a mass murderer, and unrepentant criminal. President Mohammadu Buhari, when he was alive, appointed some service chiefs but on his death, these service chiefs, knowing how Jubril was brought in to replace the former president, continually disobeyed his orders. When the people of Benue State were massacred by the Fulani Herdsmen, President Muhammadu Buhari aka Jubril commanded the Inspector general of police to relocate to Benue State, but unfortunately, he disobeyed. When Jubril visited Benue, he lamented that he was not aware that the Inspector General of Police, Ibrahim Idris ignored his instructions to relocate to Benue state. No punishment was given to Ibrahim Idris as this might expose the cabals. In the history of Nigeria, no President has ever issued an instruction to his subordinates and that instruction was not carried out. 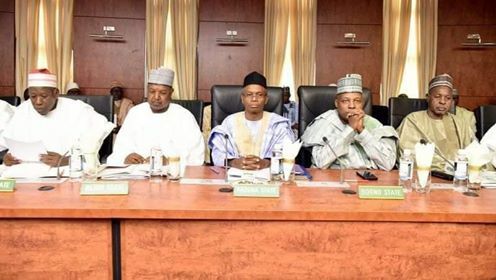 The secretary to the Government of the Federation, Babachir Lawal, was accused of misappropriating the funds meant for the Internally Displaced People (IDP) and was asked to resign but he refused, knowing that the person in Aso Rock, Abuja is an impostor. Through mass kidnappings, bombing, and other acts of terrorism, Boko Haram remains an enduring threat to Northern Nigeria and the Lake Chad Basin. The Minister of Information and Culture, Alhaji Lai Mohammed on several occasions, lied to Nigerians that war against Boko Haram has been technically defeated. This lie was refuted by the Metele Boko Haram attack where more than a hundred soldiers were killed and more than 31 soldiers left wounded. Also, Lai Mohammed denied that ransom was paid to Boko Haram to secure the freedom of Dapchi girls kidnapped by Boko Haram in their school in Dapchi, Yobe State on 19 February 2018. The Cabals running Nigeria will always take charge of any government that emerges in this country, whether formed by the Peoples Democratic Party (PDP), All Progressives Congress (APC), or whatever political party. This country is just recycling the same old faces for years.